This Limited Release pin features Minnie Mouse in an old sepia snapshot. The photograph is of a brown toned Minnie from the waist up. Minnie has her arms behind her. This listing is for the Minnie in Striped Skirt pin ONLY from the Minnie Paris Fashion Glamour pin set #90812. This pin features Minnie Mouse in a standing pose with a light purple/grey skirt with black stripes. She also is wearing earrings, white polka dot hair bow, high heel shoes, and a belt. She holds a handbag purse. Pins in this set: #90813-90819. This listing is for the Minnie in Pink Formal Dress pin ONLY from the Minnie Paris Fashion Glamour pin set #90812. This pin features Minnie Mouse standing in a long, pink dress with a slit. She also is wearing earrings, pink hair bow, white formal gloves, pink high heel shoes, and a decorative dress belt. She holds a grey colored handbag purse. This listing is for the Minnie Wearing a Hat pin ONLY from the Minnie Paris Fashion Glamour pin set #90812. This pin features Minnie Mouse in a standing pose with a light purple/grey jacket, red skirt with a belt chain, and red high heel shoes. She also is wearing a hat with a black ribbon and a red bow. She holds a purse. This listing is for the Minnie Mouse pin from the open edition Mickey Mouse Icon mystery collection (#86540). This open edition mystery collection features various Disney Character on the Mickey Mouse icon. This pin features Minnie's red with white polka dot dress and bow. This listing is for the Minnie Mouse pin from the open edition Disney Characters as Cars Set (#94915). Minnie Mouse is holding a bouquet of flowers. Next to her are the words "Happy Mother's Day 2002" with a little bird perched on top. This open edition pin features Minnie Mouse standing behind the logo for Minnie's Bowtique, a store packed with the coolest bows and bow-ties. Pin shows Pie-Eyed Minnie and Mickey Mouse riding a snow sled. Minnie has a red sparkle/glitter hat with a poinsettia flower. She has a red and white striped scarf. Mickey is wearing a white scarf. Inspired by Bentcils, this Open Edition pin features the outline of Minnie Mouse. Minnie Mouse is wearing a nerdy outfit including a pink bow, white shirt, pink plaid dress, black tie, pink shoes, and pink glasses. Minnie Mouse is one of a series of pins in brass, released in department stores as part of a grouping of pins manufactured by Monogram Products, Inc. of Largo, FL. She is dressed in a letter sweatshirt, skirt and sneakers; she holds books in her left hand. This is a "cutie" little Minnie face pin that has no mouth. She does have a red bow and eyelashes. This pin is the old style Minnie Mouse on a blue background. This listing is for the Mickey pin from the open edition Classics Collection #1 mystery collection (#98368). 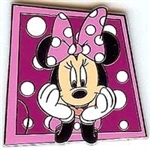 This listing is for the Minnie Mouse pin from the open edition Classics Collection #1 mystery collection (#98368). This open edition mystery collection features Mickey Mouse in various artistic styles. This pin design features a black, white, and grey Minnie Mouse with her flower hat, as she appears in classic cartoons such as Steamboat Willie. This listing is for the Minnie Mouse pin from the Magical Mystery Pins Series 6 Collection (#98868). This pin features Minnie Mouse in a pink circle with a starburst behind her. Minnie is wearing a princess hat. Minnie Mouse on a red rocket. Has "Discoveryland" in blue and in a blue box, and EuroDisney(c) in a white box. Cutie Minnie Mouse is looking as cute as a button in this Open Edition pin. This pin features a full body image of Minnie and measures approximately 1" tall. This limited release 2013 Christmas Ornament pin is attached to the to the Disney Holiday Gift Card series. This series is made up of four Disney Holiday Gift Cards. The Minnie Mouse gift card features her with a Santa cap and a wrapped gift in front of a Christmas Tree. Minnie, with her eyes closed, is using a puff to powder her face. This is the Minnie Mouse as Beatrice Starr pin from the Scoop and Friends collection of 2010 Hidden Mickey Pins at WDW. This pin will only be available by trading with a cast member. Minnie Mouse is popping out of a red "08" that looks a lot like a hidden Mickey head. The 8 has white dots just like Minnie's dress and bow usually6 have, and the 0 is solid red. 12 months of magic pin, apparently released after all the pins in this series were pulled from the racks. Country stamp pin of Japan. Minnie carrying two shopping bags, which have Disney Store written on them, is standing in front on a Japanese arch. Jerry Leigh - Florida Series (Minnie Mouse ?Am I Cute or What?? Minnie is wearing a yellow dress with pink shoes and bow. Flowers are seen in the background and the phrase "Am I cute or what?" is written next to Minnie. Celebrate Mother's Day with this Open Edition pin featuring Minnie Mouse wearing a lavender/light purple dress and matching hair bow and dark blue or purple (not sure) shoes. She is holding a two-tone pink award rosette ribbon with a yellow center that has the message: "World's Best Mom" in black lettering. Minne Mouse with red bow in hair and blue dress. She is making a curtsey and under her is a round yellow circle with the words Minne Mouse printed in pink letters. Part of the 12 Months of Magic series at the DS. This pin belongs to the Sugar Skulls Mini-Pin set. #102030 The skull has red hearts for Minnie Mouse's eyes and the crossbones are Minnie's familiar red with white polka dots. Minnie Mouse is wearing a blue dress, white underwear, and white gloves. She has her arms wide open, as if she were saying "welcome". Her shoes and ribbon in her hair are lilac color. Minnie's tail makes a rare appearance on this pin, it is gold-toned and shows just above her left shoe! This piece from the tangram set features a shy Minnie Mouse on a pink background. The piece is the medium triangle. The pin is 3/4" wide and 1 1/2" tall. The back of the pin is stamped with the 2008 ODPT logo. Minnie is dressed in a red dress with a pair of yellow shoes and a red bow in her head. Open edition Minnie in Leopard Pants pin. This pin features a print screen element. Open edition Boho Minnie pin. This pin features a print screen element. Open edition Minnie Mouse pin. This pin features stone embellishments. Open edition Minnie with blue bow pin. Minnie also has a white face on this pin. Says "©Disney Made in China" on the back. Minnie is wearing white on red polk-a-dot dress and hair bow, with a solid red top and yellow shoes. She is doing a curtsey, holding the hem of her dress, and the left foot in front of the right. Minnie is looking up to her right with a smile and her hands under her chin. Her speech bubble says "WONDERFUL!" Her background is pink. Mickey and Minnie are dressed in red Santa hats which extend upwards to meet at the top of the pin around the words Feliz Navidad. Mickey has a gift for Minnie which is wrapped in blue paper with a yellow ribbon and bow. From the i in Navidad is a spring a mistletoe. Open edition Minnie POW pin. This pin features a print screen element. This pin is of Minnie Mouse in a square that looks like a stamp. It is in blues, reds and greens. This listing is for Minnie Mouse pin ONLY from the Disney Tsum Tsum Pin Collection #108000. Pin was released in May of 2001 to commemorate this year's graduating class. It depicts Minnie Mouse in a purple graduation gown holding her diploma. Background is a yellow and pink star with the words Graduation 2001 underneath. #6 in TDS 100 Years of Dreams series (of 100 pins). Black and white Minnie. She is standing along side a cow (named Carloine). They are both looking straight (to the left) with very shocked expressions on their faces. This is from the 1st Mickey Mouse cartoon ever made, Plane Crazy. This listing is for the Minnie Mouse pin ONLY from the 2015 Dated Booster Set (#107568). Small pin of Minnie's head with pink bow. This pin is the companion to Mickey (#601). Pin measures 1" (25 mm) wide by 1 1/16" (27 mm) tall. This pin was released as part of the May 2015 Park Pack, the first in the series. It was released first as part of the pack but will be introduced in the parks as an open edition pin at a later time. The pin features a bow, presumably Minnie's, and has an American flag design. The blue background to the white "stars" (a combination of tiny stars and Mickey heads) is glittery, as is the red center of the bow. This pin features Minnie sitting on a log saying " He loves me" and "sigh". It is part of the Comic Strip Booster Pack #111867 featuring characters in comic style squares. Minnie also has a white face on this pin. Says "©Disney China" on the back. Minnie is wearing white on red polk-a-dot dress and hair bow, with a solid red top and yellow shoes. She is doing a curtsey, holding the hem of her dress, and the left foot in front of the right. This pin is identical to 1129, except for the size. This pin is only 7/8" tall and 7/16" wide. This pin features Minnie on rollerblades (roller skates) skating around. Tokyo Disneyland has Party Express Event from 1/19/2001. This pin is for the Event. Minnie Mouse in a pink train. This listing is for the Minnie Mouse pin from the Magical Mystery Series Collection (108640). This pin features a Monsters Inc. door to the bedroom of Minnie Mouse. The pink door has three red hearts at the bottom by the black latch. A rounded window with a purple outline and blue interior has a red bow attached at the top left. The door stands in a Monsters Inc door station. This listing is for the Minnie Mouse pin only from the open edition "Dated 2011" mystery set (#81592). This pin features Minnie Mouse in front of a yellow circle that shows a pair of 3-D glasses. The year "2011" is at the bottom of pin in purple, red, yellow, and green colors. Minnie's head between 2 crossed swords. This pin is (C) Disney / Sedesma S.A. and it's from spain. Minnie is dressed with a green and yellow hat. Minnie Mouse's face on a colorful fuchsia box is featured in this Open Edition pin. Part of the Colorful Box Character collection, this pin also contains Minnie's autograph and the Walt Disney World® Resort logo. Minnie Mouse in fancy formal attire: Long red dress, matching red bow in her hair, white shoes, and long white gloves. She is striking quite a pose as she stands atop a red oval sign that reads, "Disney's California Adventure," and beneath that a black base that reads, "Established 2001." This four pin booster collection features characters in cutie style dressed as pirates. Here we have Minnie with a map and key. She is wearing a frilly pin and brown dress and hat and is winking. Pin depicts a stylized Minnie Mouse in a white glitter heart. Minnie is wearing a pink bow on her right ear. She has pink eye shadow and a pink dress also with a bow on it. Disney on ice pin given as a gift at LAWSON, which is a convenience store in Japan. Basically a oval pin with Centennial on top. Mickey Mouse is in a tuxedo with Top Hat and Minnie in a pink gown skating. Lawson is written on the bottom. This is a thin sheet of metal with ©Disney printed on the back. This was given or sold at the Disney On Ice's production of "Centenival" which combines CENTENNIAL of Walt Disney's birth and CARNIVAL. There are or were shows in Yokohama and Chiba. Lawson was apparently the sponsor. This pin is Minnie Mouse with blue ears, nose, and chest. She is wearing a yellow hat with a red and yellow flower on in. She is in front of a red square background. It is the pin that was launched with the event from Star Festival July 1, 2001 to 8th. It features Minnie Mouse dressed for a party. Celebrate 2017 with your favorite Disney Characters in this dated series. This pin features Minnie celebrating around colorful stars, she is above a pin on pin 2017 in colorful glittery numbers with Walt Disney World at the bottom. This is pin 2 of 8 and it features a photo of Minnie Mouse after taking a "selfie" of herself. Pin has 2 of 8 on the backstamp. This pin was originally released at the Pixar Party pin event(August 2016) as part of a Mystery Pin collection of 8 pins. It is now available at both WDW and DLR. This listing is for Minnie only from the Cute Stylized Characters Mystery Collectible Pin Pack. This 16 pin mystery collection depicts some of our favorite characters in cute cartoon-like stylized form. Each pouch contains 5 randomly selected pins. This listing is for Minnie only from the Easter Bunny Tsum Tsum two pin set, featuring Minnie and Mickey Mouse. This two pin set depicts Mickey and Minnie as adorable Tsum Tsum Easter bunnies. Minnie is a Tsum Tsum bunny with pink and yellow ears and a yellow hair bow and the companion pin Mickey is a blue bunny with a green bow tie and green and blue ears. This is a pin about 1 inch square. I do not know the origin. It has Minnie Mouse's head only front view, wearing a yellow hat with flower, against a green square background. Hollywood Tower Hotel Tsum Tsum Booster Set - Minnie ONLY - Minnie is dressed as one of the characters from the Twilight Zone Tower of Terror. She is wearing a red wig. Part of a six pin set. The Minnie only pin from the 2017 Starter Set features an all-silver, mirror-like, silhouette of Minnie Mouse on a yellow background surrounded by stars. Bottom of the pin says "2017." his pin is laid out like a magazine cover. Disney's Hollywood Studios - the starlet issue. Minnie is wearing a red dress and the headlines read red carpet secrets revealed! it isn't easy being this sweet. elebrate 50 Years of Disney Theme Park magic with this Open Edition Mickey Mouse pin. Mickey, a pin-on-pin, is dressed in a tuxedo and carrying a baton with red ribbon. He is ready to celebrate the Happiest Celebration on Earth! The background is large gold textured Mickey ears. Behind Mickey is a blue circle. Bottom portion is a blue banner reading "Walt Disney World." Under that on a white background is "The Happiest Celebration On Earth" in blue text. This pin depicts Minnie Mouse over a sign that says “MINNIE MOUSE SINCE 1928" featuring Minnie in her classic red hat with a daisy. It has a silver back with one post and a nub on either side. It has the © Disney stamp along with Mfg. by M.I.I. CHINA. It measures 1-3/8" tall by 1-1/16" wide. It comes on a black card with Mickey head icons and "Disney" at the bottom. In addition to the Disney copyright information, the back of the card also has Monogram International, Inc. This is a pin for the Hotel MIRACOSTA, which opened in September 4, 2001. Minnie Mouse standing above a banner with" Hotel Miracosta on it. Companion Pin is #7028. This is Minnie Mouse in a pink blouse, striped ra-ra skirt and a multicoloured hair accessory. She has purple eye-shadow And is smelling a bunch of flowers. For search purposes: yellow shoes, red, white, blue stripe, purple, yellow, ribbon bow, red roses. This pin features a glamorous Minnie in a white dress with black spots. She has black gloves and a white bow. The pin is a pink heart with a darker pink outline. Minnie has signed the pin Love Minnie Mouse XOXO. This pin comes from a two pin set that features Mickey and Minnie Mouse standing at their mailboxes. Minnie appears to be reading a letter with a heart on it and at the bottom of her mailbox it reads "MICKEY + MINNIE!". The pin measures approximately 1-7/8" by 1-1/2" wide. Minnie Mouse Mini pin set. Minnie's left white glove. Fingers are waving slightly, index finger is lifted slightly, 3 black streaks on the top of the glove. Part of a 4 pin set. Back is stamped with mickey waffle pattern and authentic official Disney pin trading 2017. Minnie Mouse Mini pin set. Minnie's red glitter filled skirt with white polka dots and a white ruffle at the bottom. Part of a 4 pin set. Minnie Mouse Mini pin set. Minnie's bow: Sparkly red bow with white polka dots. Part of a 4 pin set. Minnie Mouse Icon Mini pin set. Minnie's glitter filled yellow high heel shoes. Part of a 4 pin set. Mickey and Minnie smiling and riding the Mad Hatter Tea Cups with the word WHOOSH in pink glitter! The teacup is also pink glitter. The pin looks like a comic book panel. This is a Minnie Mouse pin from a 4 pin set from Hong Kong. In this pin an old-fashioned, pie-eyed Minnie is wearing a purple skirt, white bloomers, yellow shoes, and a pink hat with a purple flower on it. She is standing next to blue and yellow flowers. This black metal pin is approximately 1 inch high by 3/4 of an inch wide. This pin features Minnie Mouse in a seated position. She is wearing a very mismatched outfit. A green dress with a yellow polka dot skirt, green shirt with yellow collar. Red bow, and yellow shoes. She has a white spot on her nose. This is one of a series of the FAB 5 pins being released during the Disney MGM Studios Pin Event. These pins will be available property wide beginning Monday March 18, 2002. This is a square pin with Minnie in the middle waving his had, next two him reads Walt Disney World. The frame of the pin is beige and the background is blue. The top of the pin towards the right reads Minnie with a Minnie head in the corner, coming down reads Mouse. The bottom of the pin towards the right reads 1928. One of a collection of 16 pins in a mystery bag of 5 featuring various characters as ice cream bars or popsicles. Minnie Is black on top with the bottom being her signature red and white polka-dotted skirt, with white, ruffled pantaloons peeking out under her skirt with her legs showing on either side of the stick. There is a red & white polka-dotted bow midway offset to the left. A bite has been taken out of the ice cream bar at the top right. The bite is white with a small white melting of ice cream down the side. The stick is tan. One of a collection of 16 pins in a mystery bag of 5. This pin features Tigger from Winnie the Pooh. It's orange with black tiger stripes. There's a bite taken out of the top right corner of the bar with a white drop of melted ice cream dripping down the right side. A tan popsicle stick protrudes from the middle bottom.